If action is the goal for religious communities on energy issues, then belief is not enough, writes the executive director of GreenFaith in an excerpt from 'Sacred Acts,' a new book on the church and climate change. 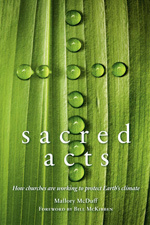 Editor’s Note: In “Sacred Acts: How Churches Are Working to Protect Earth’s Climate,” a variety of Christian writers address the role that churches can play in tackling climate change through stewardship, advocacy, spirituality and justice. In this excerpt from the chapter, “Beyond Belief,” the Rev. Fletcher Harper writes about the substantial monetary savings that churches can achieve through energy conservation and efficiency and the leadership traits of congregations that reduce their energy use. "Every morning, millions of Hindus say a prayer to Mother Earth when they get out of bed, apologizing for any pain they may cause her by walking on her during the day." When he arrived in the United States from India, the first thing Pankaj Jain noticed was the cars. “I’d never seen so many of them in India,” he said. “The cost of running them all, the air pollution -- I couldn’t imagine how it was possible.” Over time, he was inspired to change his career from software engineering to studying the link between Hinduism, Jainism and the Earth. Now he’s an author, a professor at the University of North Texas and a rising Hindu environmental scholar. In my own work during the past decade with the organization GreenFaith, I have met Christian, Muslim, Jewish and Hindu leaders like Pankaj who are highlighting these connections between their faith traditions, energy use and climate change. Based in New Jersey, GreenFaith is an interfaith environmental coalition that works with faith communities nationwide to help them integrate the environment into their ministries. Among our many programs, we have conducted dozens of energy-conservation workshops for religious audiences and carried out more than 100 energy audits at religious facilities. I have watched hundreds of congregations address issues related to climate change, from installing solar panels on churches to improving energy efficiency at synagogues. This level of activity is a welcome and marked change from past decades, when energy conservation and environmental advocacy were low priorities in religious circles. But in the midst of this increased activity, I have witnessed many missed opportunities -- opportunities for savings, for involving a wider range of congregants in energy issues, and for making energy leadership within the church more than a rhetorical exercise. The past decade has brought increased religious discourse on the moral and spiritual dimensions of energy use. Christian groups including liberal Protestant, Roman Catholic, Eastern Orthodox, and Southern Baptist leaders have denounced our current patterns of energy use as sinful and called for repentance in the form of individual and national commitments to energy conservation and renewable energy. Energy and climate change have made it onto the educational and advocacy agendas of more houses of worship than ever before. From the election of President Barack Obama through 2009, momentum grew in support of federal legislation that would commit the United States to reducing its greenhouse gas emissions. In 2009, the US House of Representatives passed the American Clean Energy and Security Act (ACES), with support from many religious groups. Legislative victory seemed to be a real possibility. In December 2009, however, the United Nations Climate Change Conference at Copenhagen failed to reach any binding commitments. And in 2010 the political climate in the United States shifted. It soon became clear that the US Senate would not take up climate legislation, eliminating the possibility of any legislative action on climate change before 2013. This legislative defeat has important implications for church-based efforts on climate change. Through much of 2010, most religious action on energy issues lay in the area of education and advocacy on climate change. But the legislative defeats, coupled with efforts to defeat or roll back climate legislation at the state level, have made it clear that the battle for comprehensive climate legislation requires cultural support that is both broader and deeper than currently exists. I believe that churches, along with other faith-based institutions, have an opportunity to help create this cultural change by implementing efforts on a wide scale to cut energy use, reduce greenhouse gas emissions, save money and engage new members in their congregations. A modest number of religious institutions have done exactly this and have offered an important public witness. They have invested in energy conservation and efficiency and have seen substantial financial benefits. These houses of worship have created cultures among their members in which smart energy use becomes a point of pride and a congregational norm. The challenge now lies in replicating the success of these pioneers and making responsible energy management and advocacy a priority across denominations. The logic behind this is simple and the self-interest of congregations powerful. The potential for energy savings at church is substantial. This is especially critical when church budgets are under pressure from the economic recession or from static or declining membership and pledges. The US Environmental Protection Agency (EPA) reports that if the estimated 370,000 houses of worship in the United States cut their energy use by ten percent, the savings would amount to more than $300 million. The money saved could support outreach to those who are hungry, homeless or out of work; it could fund education, evangelism and mission-related work; it could be reinvested in retrofitting buildings in ways that would lower the energy use of religious institutions even more. These savings represent found money -- the biggest single source of available revenue to American religious institutions. Investments in energy conservation and efficiency offer congregations the chance to reduce operating expenses without cutting programs, while also offering an important witness for the Earth -- a priority for many young, unchurched families. For churches, there is no better opportunity than energy conservation to promote organizational growth, public witness and financial gain at the same time. In the face of this potential windfall, however, most churches still do nothing to manage their own energy use or concern themselves with energy issues -- except pay their monthly bill. A disconnect exists between the theological statements of most denominations, the opportunities for energy conservation and financial savings, and the behavior of most congregations. How can we understand this disconnect? And what are the characteristics of churches that have connected climate change, energy and theology? Growing numbers of Americans believe that taking care of the Earth is a religious responsibility. The 2006 National American Environmental Values Survey found that 81 percent of all respondents -- not just people of faith -- affirmed that “taking good care of nature is part of our duty to God,” while 87 percent believed that “the beauty of nature is a gift from God.” A nation of believers, we appear to also believe that God wants us to protect creation. While people find the idea of caring for the Earth appealing, most have yet to integrate care of creation into the pattern of their lives. This isn’t all bad -- verbal assent often precedes meaningful action. But if action is the goal for religious communities on energy issues, then belief is not enough. Quaker educator Parker Palmer coined the term “functional atheism” to describe religious leaders or communities who profess to believe but whose behavior shows no evidence to support that belief. This metaphor is relevant to religious action addressing energy and climate. What enables certain congregations to reduce their energy use and address climate change? Their leaders usually possess three qualities: they are invested in the congregation; they are committed to the environment; and they function effectively within their houses of worship. Having earned the respect of their church’s members and clergy, these leaders get things done in their congregations. Many effective energy leaders in religious institutions are motivated by their desire to see their congregations -- their spiritual homes -- steward their economic resources. “When I see these boilers go on, I see money coming right out of our collection plate,” said one leader. “That’s what motivates me.” These faith leaders are aware of the potential for savings represented by energy conservation and mindful of the value of the pledges that support their church. Often long-time members of the community, they work consistently to reduce their church’s energy use because they believe it is the proper way to run their church. Another quality of effective energy leadership in churches is a commitment to the environment. Some leaders demonstrate their commitment through frugality and restraint, the belief that being wasteful is wrong. Others voice a concern for future generations. One leader told me that he wanted his church to cut its energy use because he loved to fish, and acid rain from power plants was killing the fish in his favorite streams. The fact that their congregations’ energy use is inconsequential on a larger scale is insignificant to these leaders because they are motivated by doing their part and being an example to others. The third characteristic of these leaders is that they know how to achieve concrete outcomes within their congregations. They are able to build consensus around action on energy, organize volunteer efforts and mobilize human and financial resources. This represents the keystone of all congregational efforts focused on energy and climate change. If a congregation does not have a trusted leader -- frequently a lay leader -- who can organize a multi-pronged effort that impacts finances and building management, it will be difficult to address energy issues with any success. If this leader cannot listen, build consensus, manage the often divisive nature of energy and climate discussions, and persevere in the face of inertia, little will get done. I have observed these three characteristics in successful energy efforts in churches, and I offer stories from congregations in New Jersey that describe these leaders in action. Their examples are the best resources we have to help our churches become “not just hearers of the Word, but doers” when it comes to energy and climate change. Excerpted from “Sacred Acts: How Churches Are Working to Protect Earth’s Climate,” Mallory McDuff, editor, New Society Publishers. Copyright 2012 by Mallory McDuff. Used with permission.